After our amazing tour of the White House, we went back to our vehicle which we parked at the Reagan Building. I got my purse and Nikon because I couldn’t have those items at the White House, and there is no storage area for items at the White House, either. If you have prohibited items with you, they will not let you place them somewhere for the tour, you just don’t get the tour. All of the walking and excitement got us very hungry. We manged to find a Starbucks which was inside of another building. We got some expensive coffee, two large muffins and an apple which we shared. We then headed for the Metro station for the first time. Because it was later in the day, the Metro wasn’t crowded. I still gave the kids a good speech about staying together, not spreading out in the car (or we might not all get off together) and told them to be quick, quick, quick! We won’t mention the fact that I was so nervous that Matt told me I was hurting his hand as I held it, or that Mitchell said I grabbed his shirt from behind so hard that I stopped him from moving for a second…yeah, let’s not talk about that. The point is, we made our connections with no problem and the kids loved riding the subway. 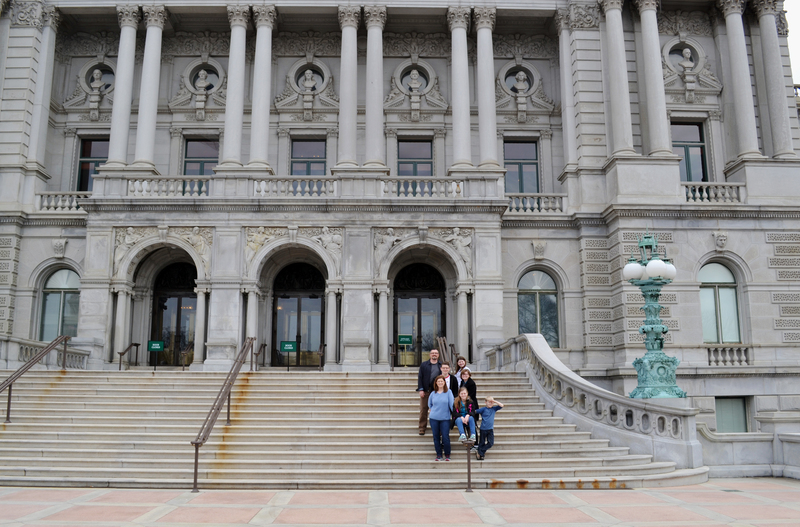 We had a tour of the Capitol scheduled for 2:00 PM. We needd to kill some time before that, but we couldn’t stray too far from it either, or we would be late. 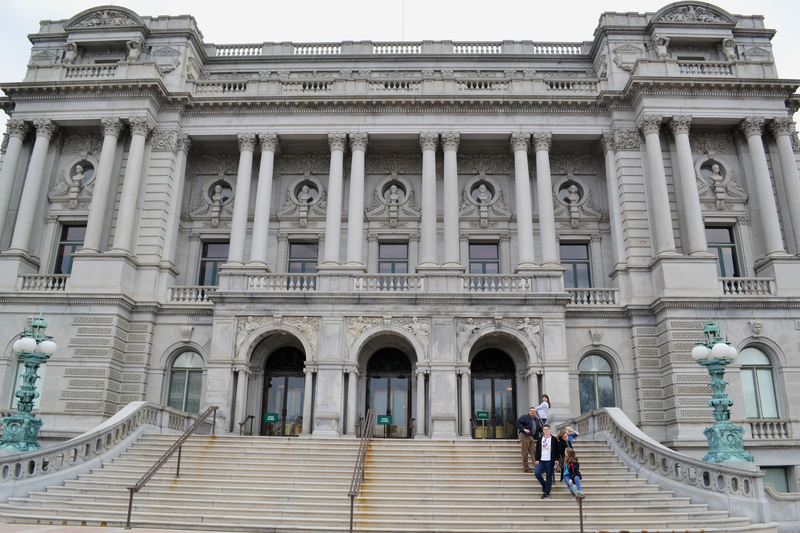 It was thrilling to see that the Library of Congress was very close to the Capitol! 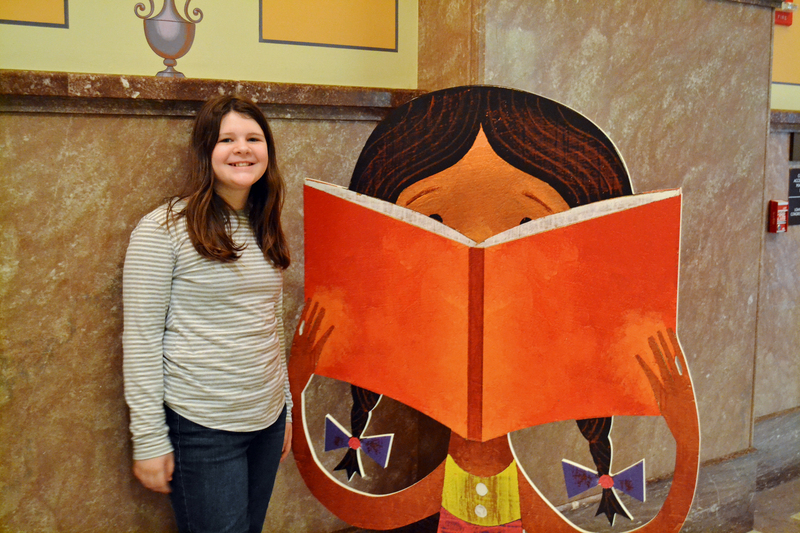 With our love of books, and the experience our older children have of working in our local library, everyone was eager to go inside this massive, glorious, spectacular library. And let me tell you, it was a booklover’s dream come true. I only ask that you take me back with you if you’re going, or if you know someone who works there, please have them hire me?! Oh, excuse me…*ahem* Where was I? As we walked up to this impressive structure, I wanted to get a group photo of everyone in front of the building – well, it would be in two groups. I was snapping away when a kind security guard offered to take the photo of all of us together! How sweet of him! It would be one of very few. Thank you, Mr. Security Guard! Here’s a closeup of part of the outside of the building. 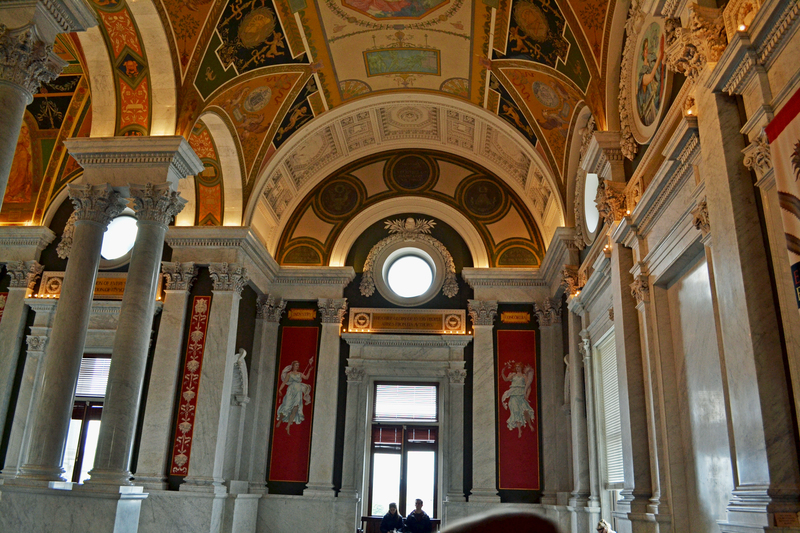 Once inside, we were completely blown away by the amazing architecture and elaborate sculpture everywhere. I mean, just look at this! 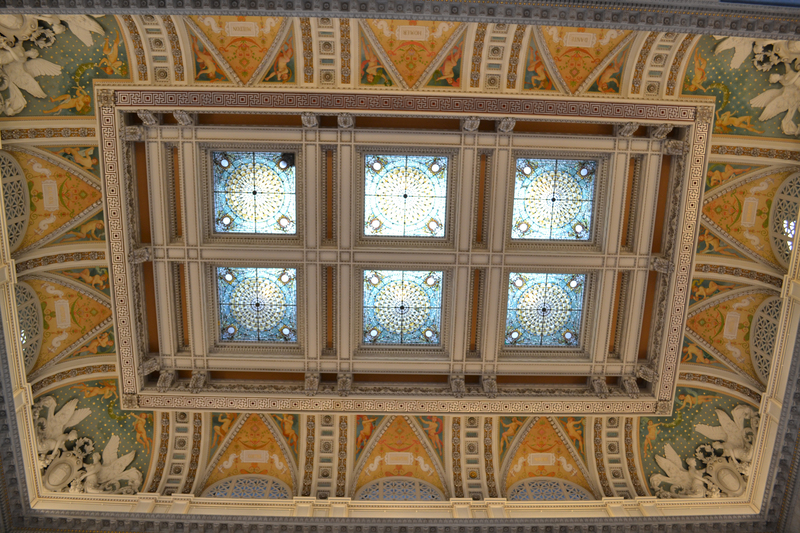 Ornate mosaics covered the ceilings. 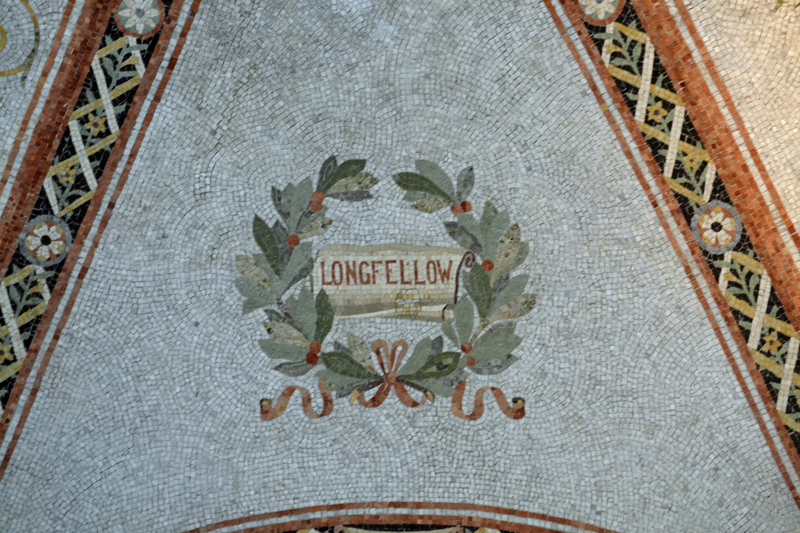 I just love Longfellow, so I took a photo of his “section”. Many famous American poets and authors are represented in this way. 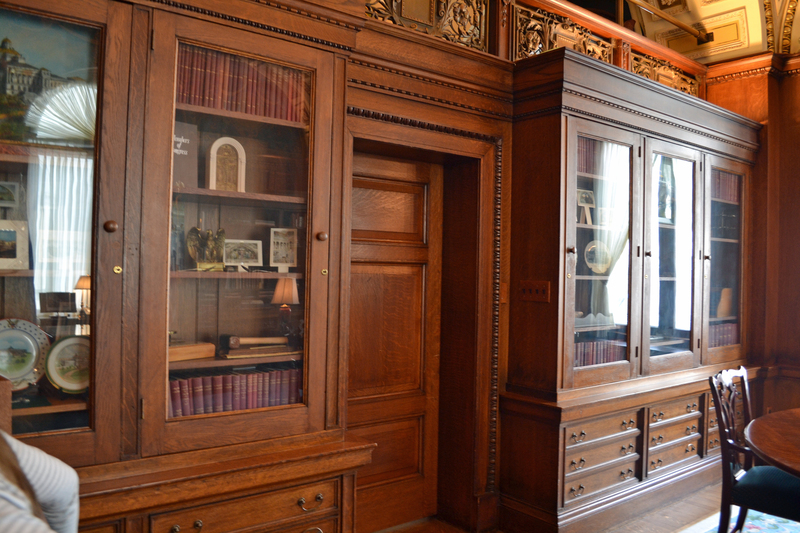 I would love to see the Librarian’s current office. 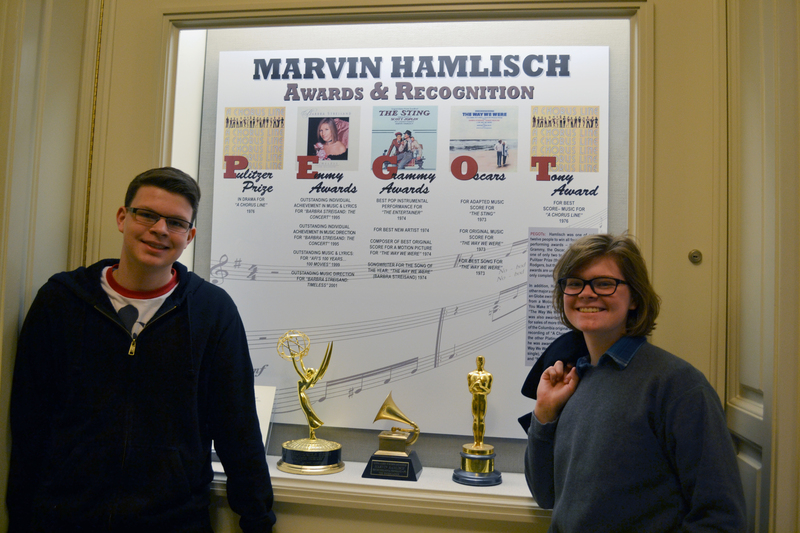 The awards earned by composer and conductor, Marvin Hamlisch, who died in 2012. There was an area of the library dedicated to Bob Hope which had many interesting artifacts from his life. 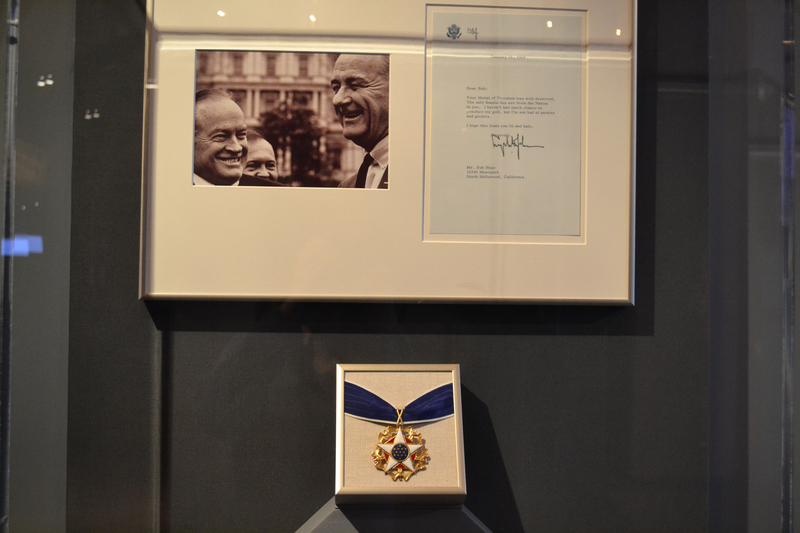 This is the Medal of Freedom that was awarded to him by LBJ. 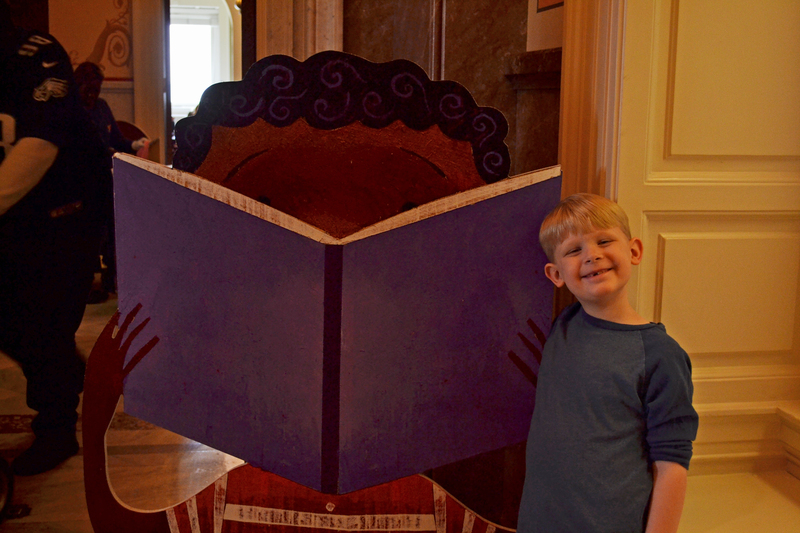 Next, we headed to the Children’s Reading Room! The halls were absolutely gorgeous. 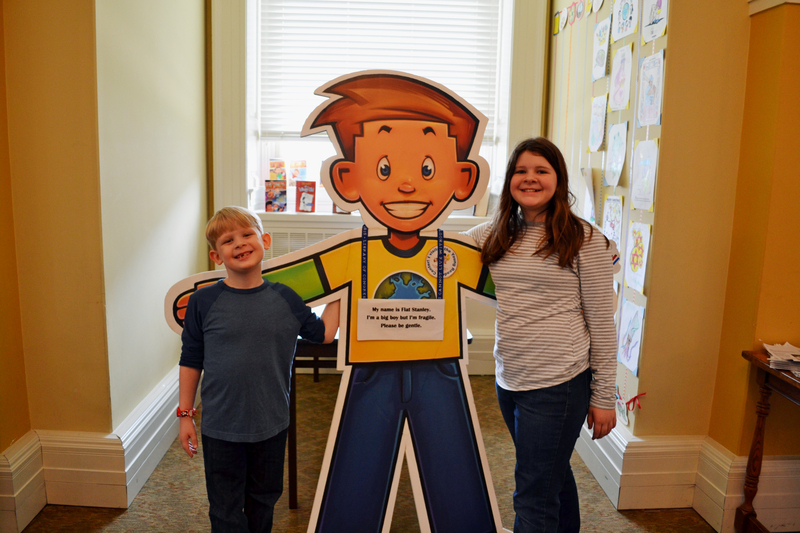 Flat Stanley was at the Library of Congress! 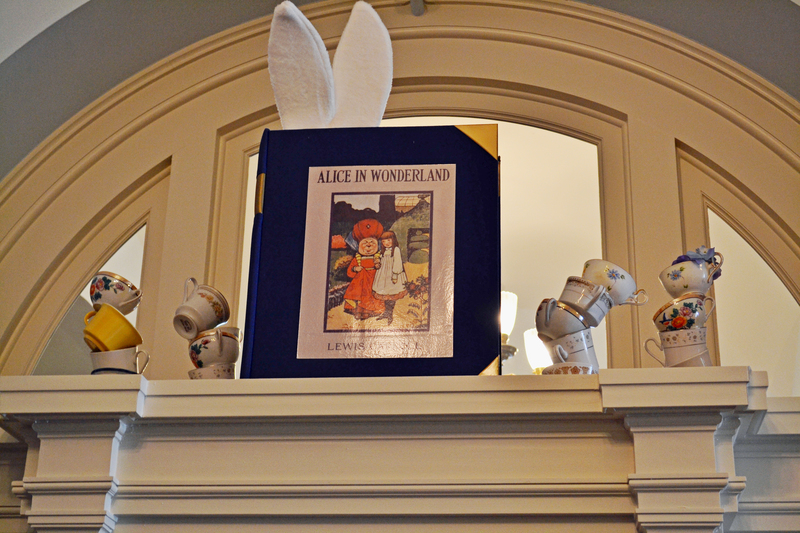 My mom read that book aloud to the kids a few years ago during one of her visits. They were so excited to see him! 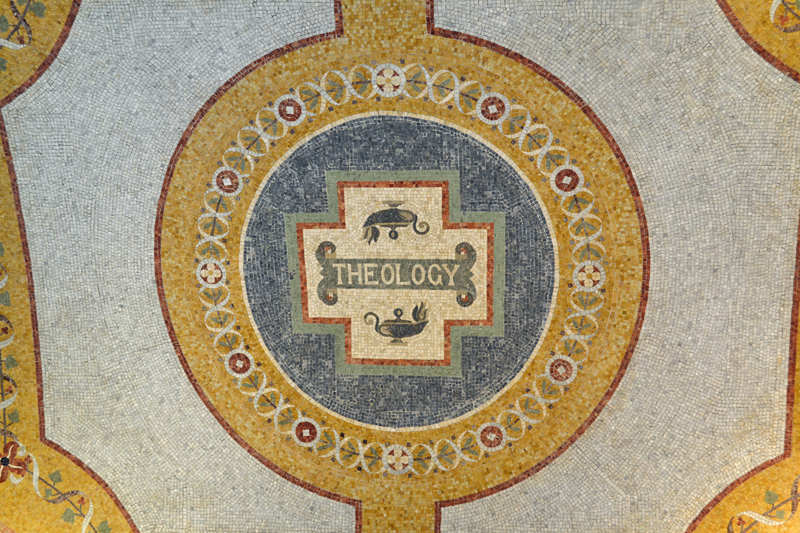 This was above the door in the Chidlren’s Reading Room. 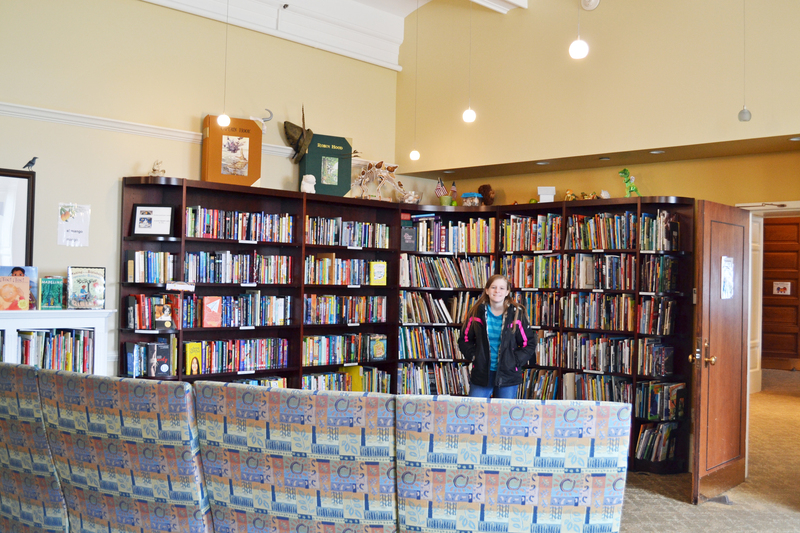 Leslie is standing in part of the children’s area. 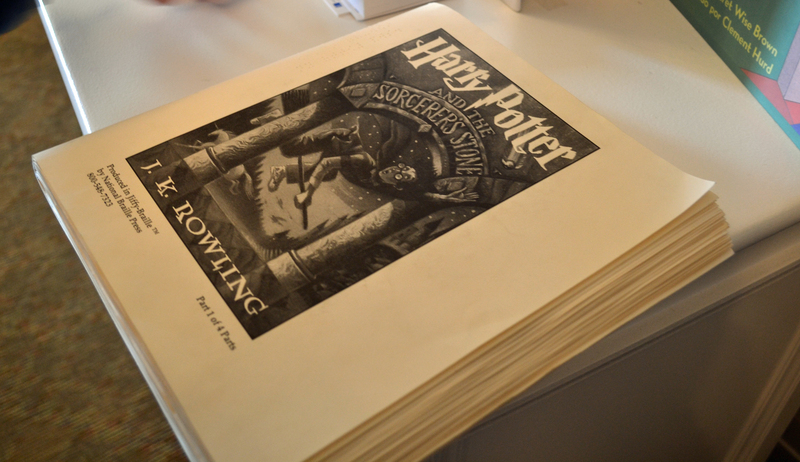 A Harry Potter book in Braille! This is part one of four parts. 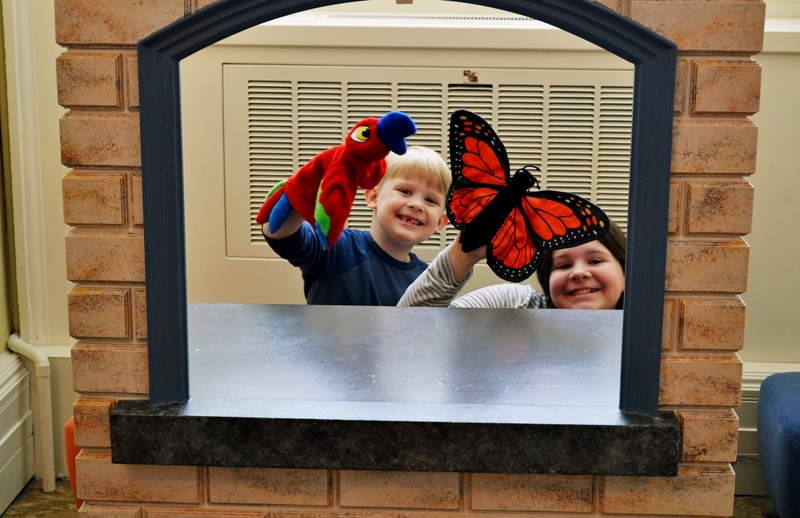 Laci and Matt gave a little puppet show in the Children’s Reading Room. There was also a small table with coloring pages and crayons available for visitors. 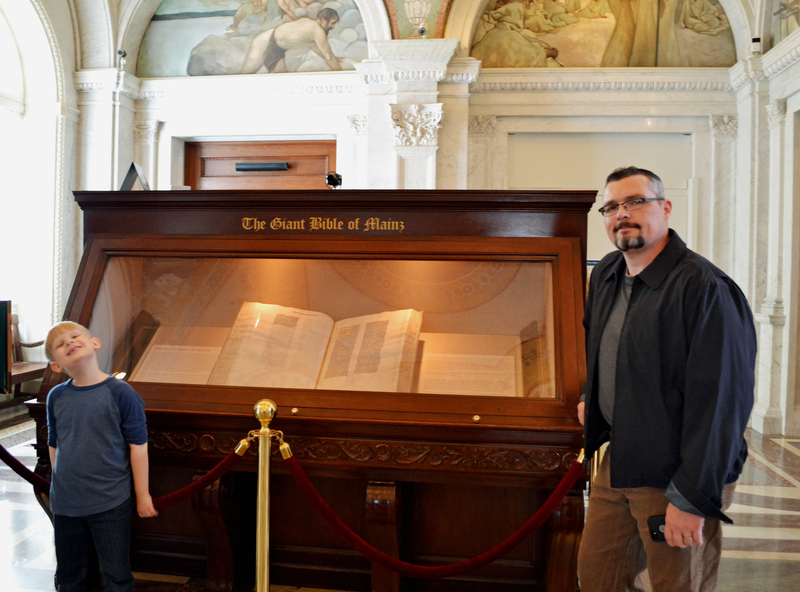 There was a display of ancient Bibles. We couldn’t pass up getting a photo of these national treasures. 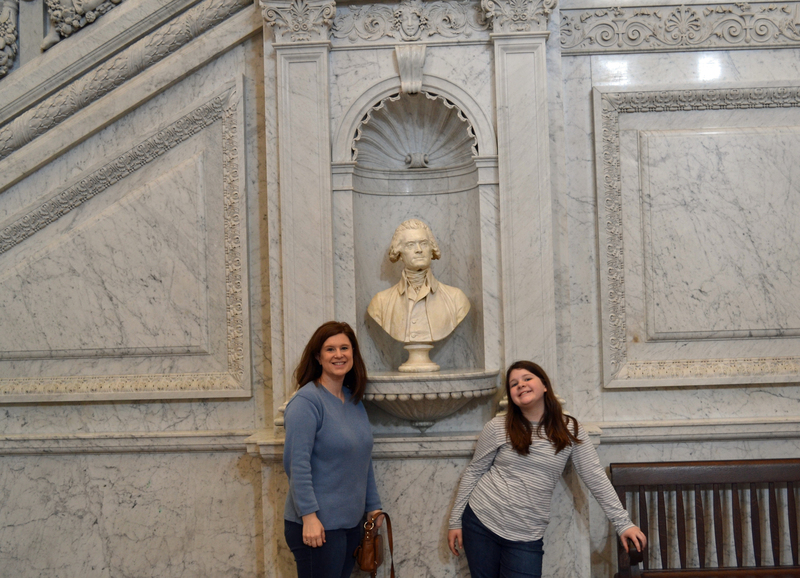 Laci and I with a bust of Jefferson. 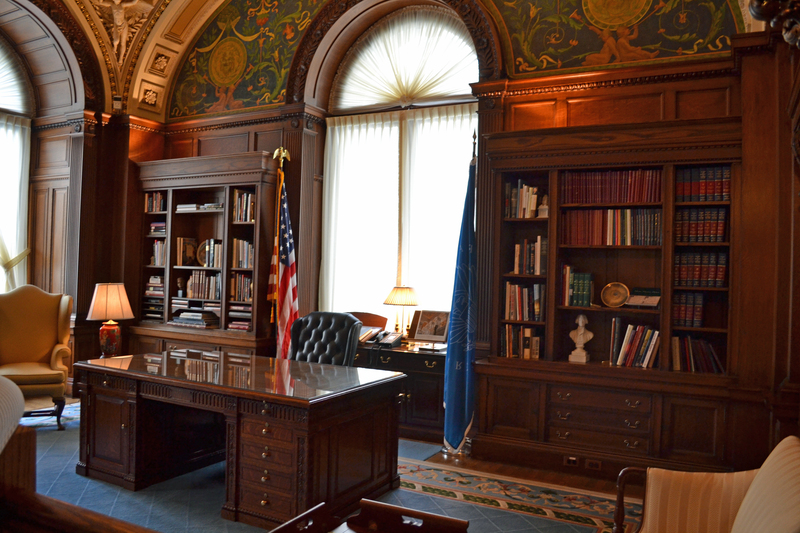 He donated his personal library to start our Library of Congress. 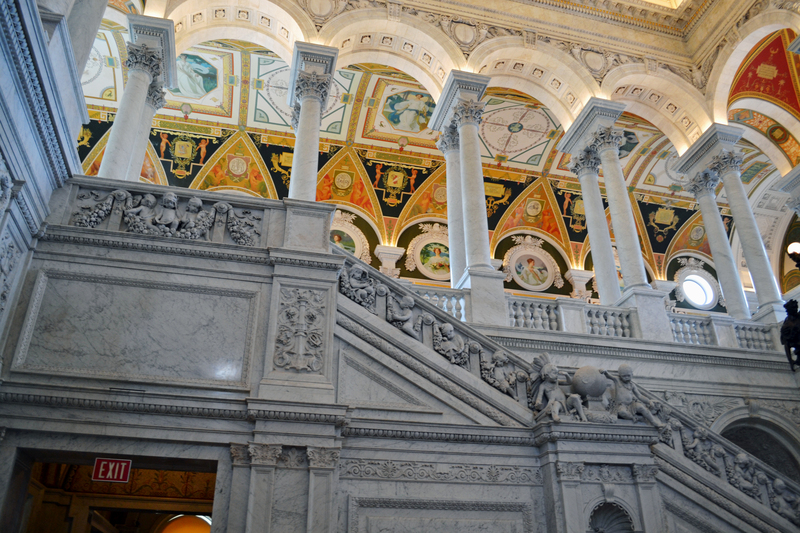 I could have stayed in the Library all day gazing at the walls and ceilings. 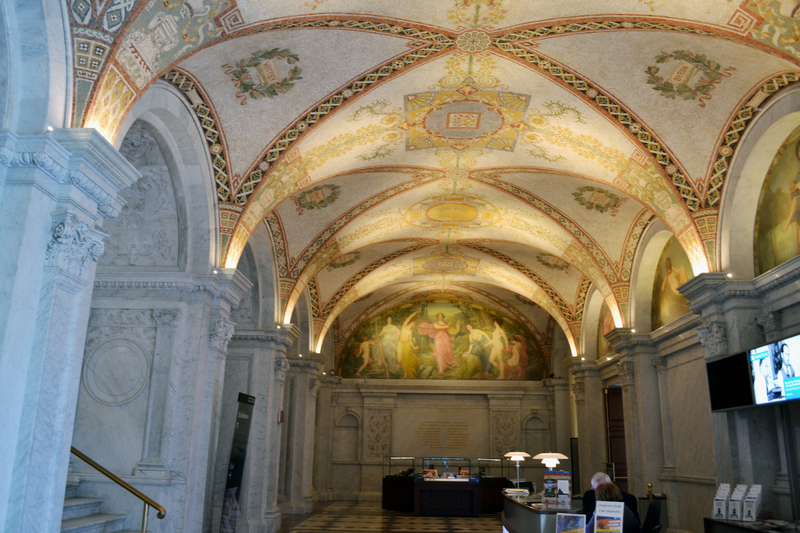 Here are just a few photos of the majestic building. These really don’t do it justice, so I hope you can visit (or have already been able to visit) in person. From the second floor, looking straght across. 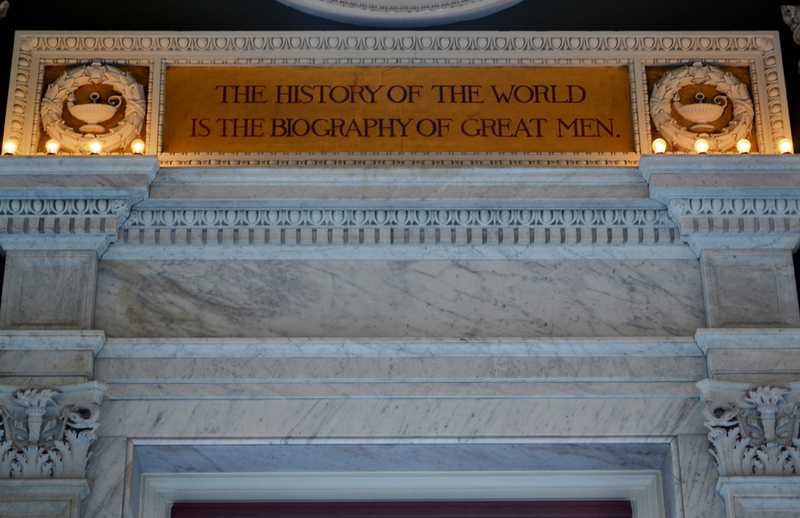 The carving above the door says, “The chief glory of every people arises from its authors”. Sayings were carved above every window and door. From the main lobby area, first floor, looking above to the second floor. Looking up at the ceiling from the first floor. 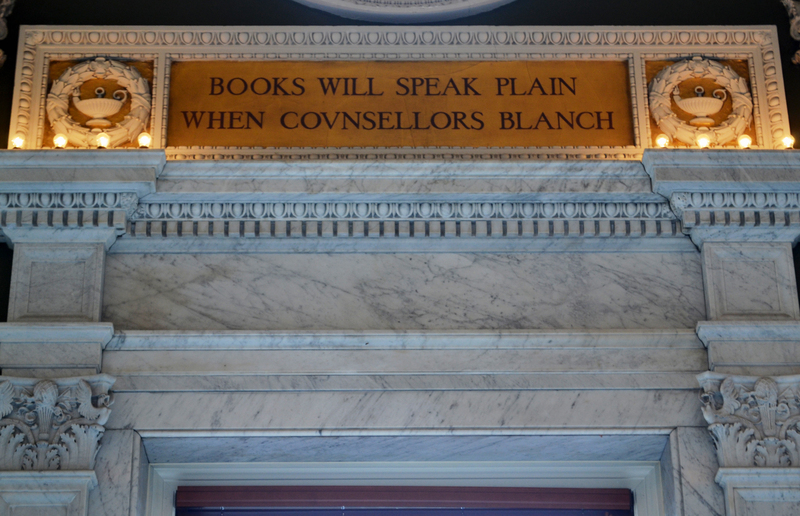 What a lovely word to have on the ceiling of the Library of Congress! The oldest three children were allowed to browse on their own, while Terry and I had the two youngest with us. We all saw the same things, just not necessarily together. 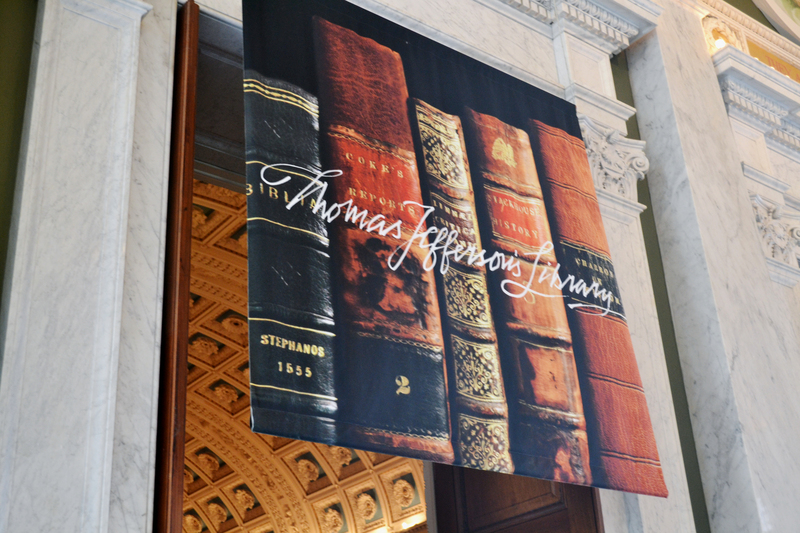 Everyone was able to see the main exhibit which was Thomas Jefferson’s personal library! The books were marked with ribbons. 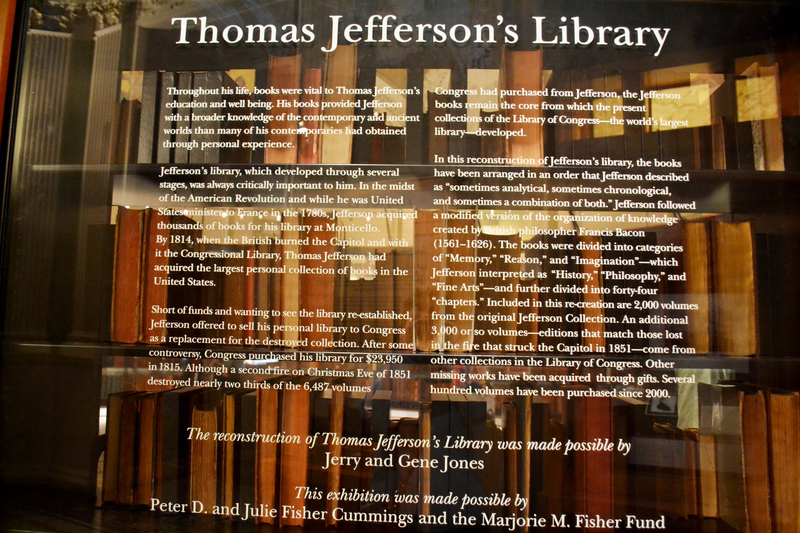 Green ribbons indicated a book that Jefferson actually owned and touched; brown ribbons were books that he had owned, but the library did not have his personal copy, so they purchased an original to replace the missing volume. 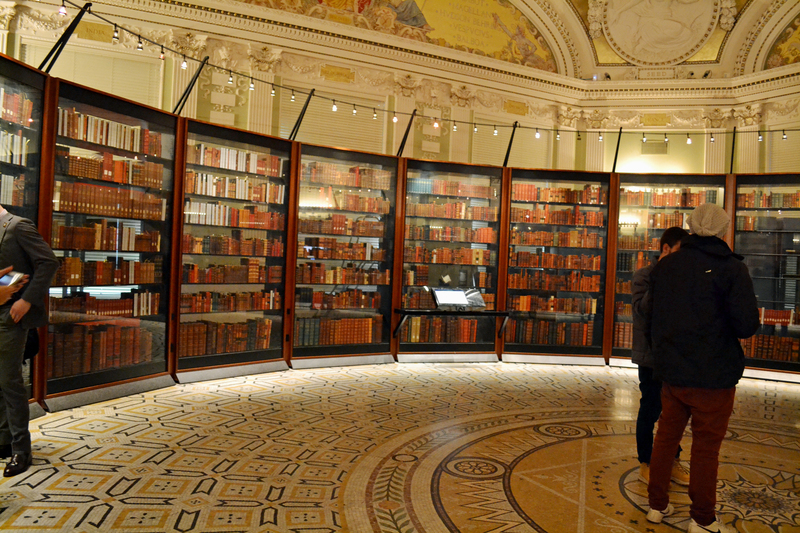 Some books were out at other exhibits or were being restored or used, so the spaces were marked for that as well. The only complaint I have was that the room was stuffy. An usher who was supervising the area told me the air conditioning had gone out and was being repaired. The lights were low, and the glass caused all kinds of reflection problems when taking photos; and of course, no flash photography allowed. I did get a few pictures, though. It’s not every day you get to see the books owned by the second governor of Virginia, the author of the Declaration of Independence, first Secretary of State, second Vice President of the United States, third President of the United States and the founder of the University of Virginia! This is one of the sayings on the wall that I liked. This one is my favorite saying of the ones I read. 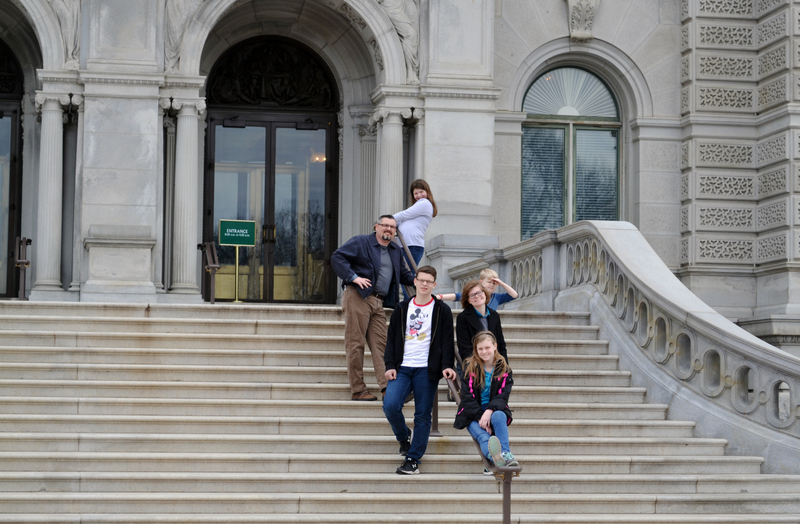 After we toured the Library, we had to save a little time for lunch before our 2 PM Capitol tour. 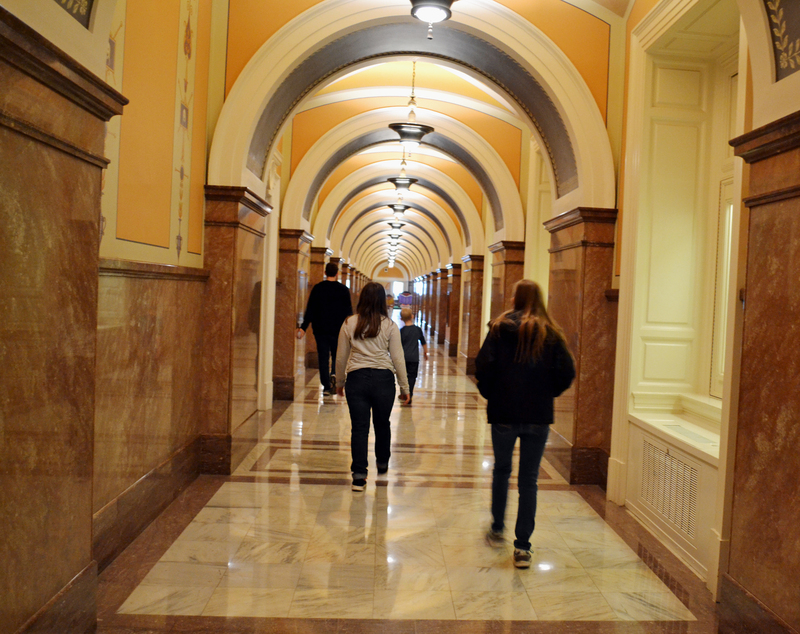 We learned that there is a restaurant at the Library of Congress, so we walked about 17 miles (slight exaggeration) through tunnels that lead from one building to another, rode an elevator, and somehow ended up on the fourth floor of a building where there was a large cafeteria. It was quite an expensive meal, that’s for sure. 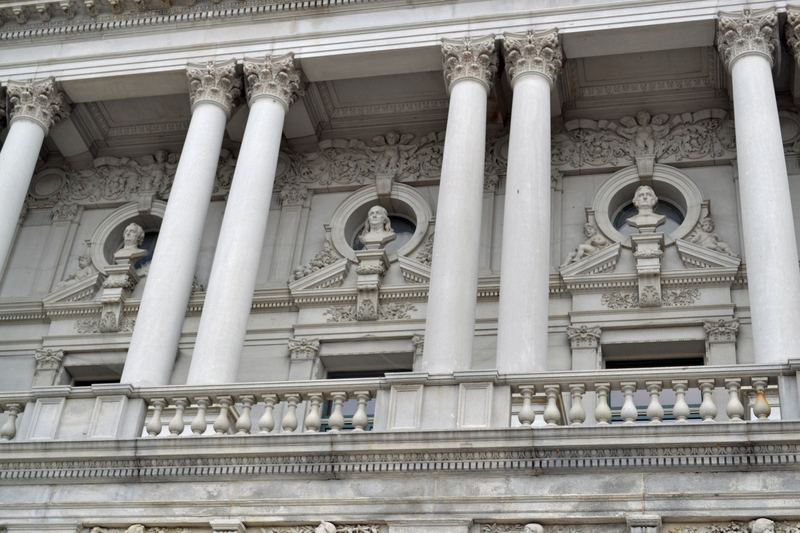 D.C. has you over a barrel (as my dad used to say) when it comes to eating establishments. The fast food places are on the outskirts, or inside high-rises, like the Starbucks we visited earlier that day, so they are hard to get to. If you’re on a schedule, you either must go hungry or pay the price. It was, however, very good food and a great view of D.C. After re-fueling, we were ready to trek out of there and on to our next destination: the United States Capitol! I really enjoyed reading this post. Thank you for taking us through another tour . . . I already love this place, thanks to you! 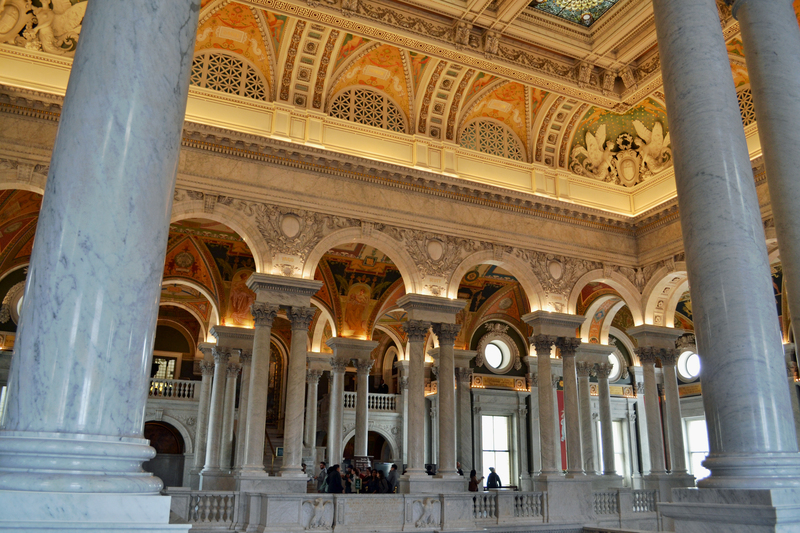 I love visiting libraries and if it’s something like the Library of Congress, I’d enjoy it even more. I must say that you’re keeping my list very long now, that is, of places we must visit when we go to Washington DC. 🙂 It’s a very impressive place! 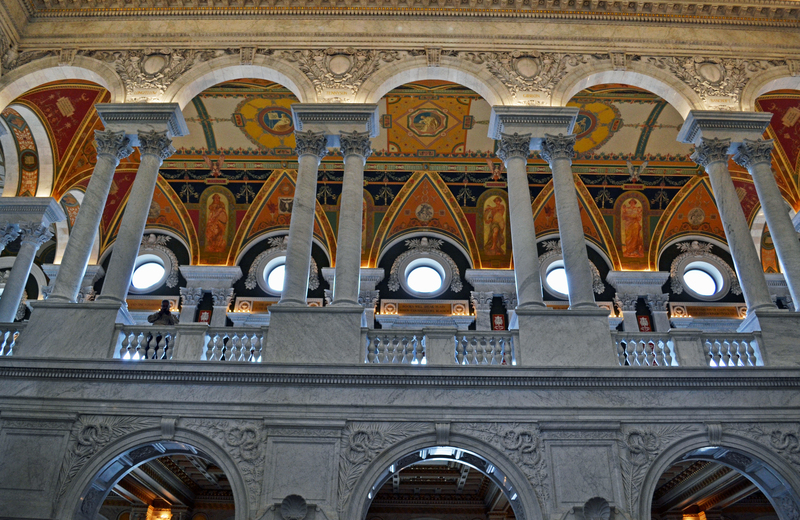 A beautiful building indeed, and the interior reminded me so much of so many historic buildings in England. 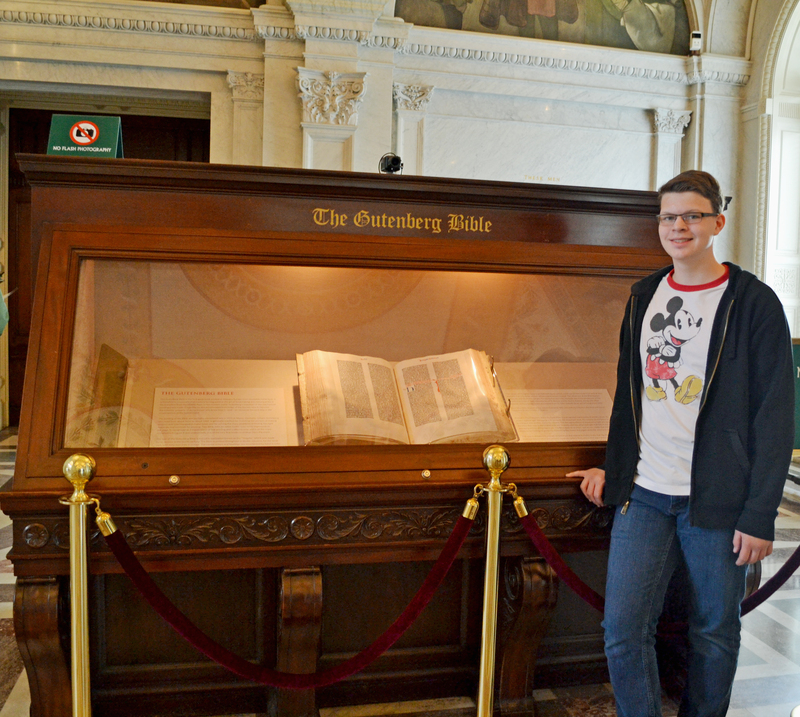 Amazingly they even have antique bibles on display! 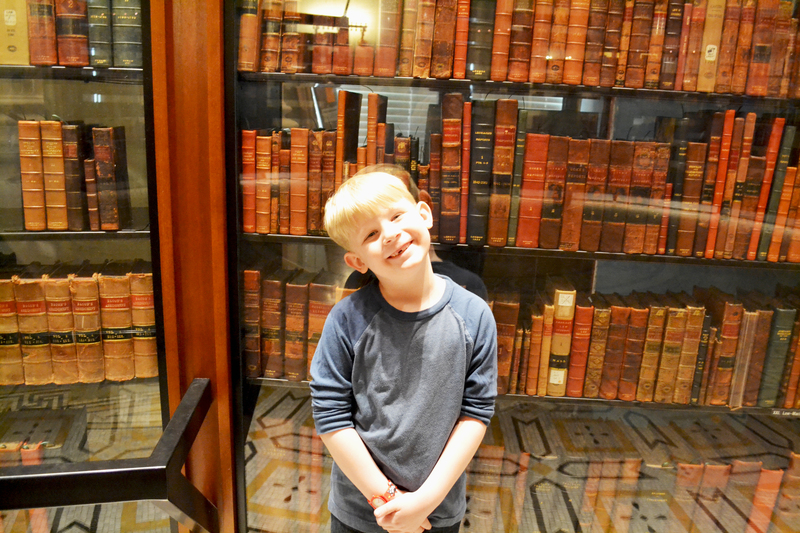 Btw, when you come visit London we’ll definitely take you to the British Library (one of my favourite places to hang out in the city, I am a frequent guest there), I am sure you’ll love seeing all the original copies of different ancient bibles and manuscripts, the massive library of previous monarchs, etc. Also, you can even listen to the voice recording of Queen Victoria, Florence Nightingale, and many other famous personalities of the Victorian era. I understand! I have a very long list of things to see in London! I definitely want to see the British Library. It sounds wonderful! I’m glad you’re enjoying the tours. I wish I could take you around D.C. myself. I actually knew a few facts about the White House that some of the Secret Service agents didn’t know (who are trained to give tourists information). I loved being in D.C., but I equally loved getting home. Thank you for your comments. Words cannot express my joy reading this post and seeing your pictures. I am so happy you shared your pictures. I would love to see this but I doubt I will be able to so thanks again for sharing.